Getting ready for a Walt Disney World vacation is an exciting time! You have visions of Mickey ice cream bars dancing in your head. But you have some important things to do before you leave home. Here are eight things you should remember to do before your Walt Disney World trip! Brush up your Shakespeare! By watching The Lion King, of course! Watching your favorite classic animations, and a few of the new hits, will make your next Walt Disney World vacation better. Characters are everywhere at the parks and resorts, so being familiar with all the characters will help you feel part of the magic! If you have small children, I urge you to look at the height requirements for any attraction your family might want to experience. That info is available right on the Walt Disney World website. I think this is crucial to managing your kids’ expectations. I’ve seen more meltdown at the front of ride queues when a child steps up to the measuring stick only to come up short. If you know ahead of time that little Johnny is too short for a certain attraction, don’t get his hopes up about it. Alternatively, you can utilize Rider Swap if you have a child too small for a ride, and another who is. Rider Swap allows the child(ren) tall enough to ride to experience the attraction twice, once with each parent or guardian, while the other stays with the little ones! These two items work in tandem for me, each protecting from the heat and sun. It’s really important that you stay hydrated in the parks! Likewise, remember to apply sunscreen. Don’t just put it on in the morning, reapply sunscreen periodically throughout the day. You don’t want dehydration or sunburns to get in the way of fun! Florida may be the Sunshine State, but it sure rains a lot. 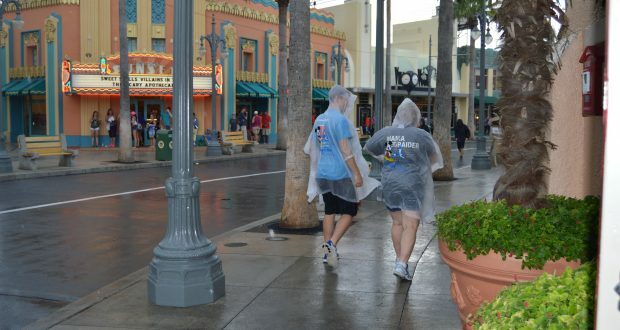 Throw some disposable ponchos in your park bag. They don’t take up much room, and will save you tons of money compared to buying them in the parks. Even if you don’t need to buy new shoes, you should start walking before you leave home. Most of us live pretty sedentary lives, and a Walt Disney World vacation will tire us out quickly! Prevent fatigue by conditioning yourself before your leave home. Find a scenic path in your town, take the dog out for a longer walk (Spot will love it! ), or walk up and down aisles at the store even if you don’t need something– anything to move more! Your body will thank you for it after a long park day! You walk a lot at Walt Disney World. Looking at a map of the parks doesn’t give a true idea of how big they are. Plus, take into account the amount of criss-crossing you do, walking from your room to the bus, from the bus to the gate, standing in lines, etc. You’re on your feet all day. Make sure your feet are as comfy as possible. Don’t buy brand new shoes right before you leave! If you need new ones, because the shoes you have are worn through, buy them at least three weeks before you leave. Make sure to wear them around the house, to school or work, and to do the grocery shopping. Blisters will put a huge damper on your fun vacation! Just like with the dining reservations, there are a few attractions that need to be booked the day you can. These attractions include Seven Dwarfs Mine Train (Magic Kingdom), Soarin’ or Frozen Ever After (Epcot), Slinky Dog Dash (Hollywood Studios), and Avatar Flight of Passage (Animal Kingdom). Guests staying on-property can make Fastpass+ reservations 60 days before check-in, up to 10 days at a time. Guests staying off property can book Fastpass+ 30 days ahead of time, up to 7 days at a time. Fastpass+ is a huge perk to staying on-property! Starting 180 days out, (or 180 days before check-in if staying at a Walt Disney World hotel) you can make reservations at restaurants. By and large, you will be able to make reservations after the 180 day mark, especially if you’re flexible with your meal time. However, the really popular restaurants do fill up that fast. If you dream of eating at Be Our Guest, for example, you need to book your slot ASAP. Reservations start at 6:00am Florida time, and can be made by phone or online. There you have it, eight things you must remember to prepare for your Walt Disney World vacation! Did I forget something you always do? Let us know! Robin’s Disney journey began with Beauty and the Beast bedsheets, a Jasmine dress up set, and a purring Nala plush. As a child in the 1990s, the renaissance and classic animations alike captivated her imagination. In 2008, Robin visited Walt Disney World for the first time, and the obsession really took hold. Since then, Robin has enjoyed visiting the Happiest Place on Earth many more times. She lives in the Chicago suburbs where she is wrapping up a Masters in writing. When not at Disney World, Robin enjoys researching fairytales, eating ice cream, Netflix binging, reading and, of course, planning the next Walt Disney World vacation!